Dan Kennedy interviewed me yesterday as his special guest on his Diamond members call. My second appearance, by the way. We teased a little about his upcoming “Mind Hijacking Copywriting” event in June of 2016. Aside from Dan Kennedy, yours truly is the only other presenter invited to the event. And yes, that’s a big hairy deal. But mostly because Dan is the original inspiration and mentor that got me started on this now 20-year direct response marketing journey. I shudder to think where I’d be if it weren’t for that. I can’t even IMAGINE spending the last 20 years in a j-o-b. Anyhoo… Dan asked me if I could share only one thing about copywriting, what would it be? First of all, those “one thing” questions are tough. Because there’s rarely just “one thing” in anything. …for most mere mortal copywriters, would be a supremely difficult task. I didn’t even hesitate in answering. The big idea is the “one thing” of copywriting. Look at any successful ad, sales letter or marketing campaign. You’ll see that the foundation of its success is a unique and compelling big idea. A hook that captured the market’s attention, made them want to find out more and then got them to buy. In some cases, by the thousands of tens of thousands. Or in the case of “help I’ve fallen and I can’t get up”… by the MILLIONS. Listen, I’ll be the first to admit it. Coming up with successful “big ideas” is NOT easy. But getting that 100% right is CRUCIAL. Because if you don’t completely nail the perfect big idea, NOTHING you write will make your copy convert. Conversely, I’ve seen even half-assed copy convert like crazy when the copywriter came up with the right big idea at the right time. Finding the right big idea for your copy is the most challenging and frustrating part of our job as marketers and copywriters. You dig into all your research, like a prospector searching for the Hope Diamond. You cram it all in your noggin, as fast as possible. In one fell swoop if you can. And you continue to not think about it, involving yourself in other activities to distract your mind. …the perfect big idea pops into your head. And it may take days, weeks or even months for that process to happen. So what if you don’t have the luxury of weeks or months to allow your cantankerous cranium to work on coming up with your big idea? What if the Sheriff’s Deputy is nailing a foreclosure notice on your front door and you need to make money right frickin’ NOW? Or what if you’re a freelancer, your client has already started sending opt-ins to his launch videos, he’s telling 50,000 people on his list that the sales page will be up in three days… but you still have no clue about your big idea. If you don’t have a proven, systematized, step-by-step way of coming up with the perfect big idea for your copy… you’re screwed. And you’re going to produce a first base hit at best if all the stars align. Most likely you’re gonna strike out. That’s why I’ve dedicated the entire December 2015 issue of The Doberman Dan Letter to revealing some of my best secrets for coming up with big ideas that create big winners. 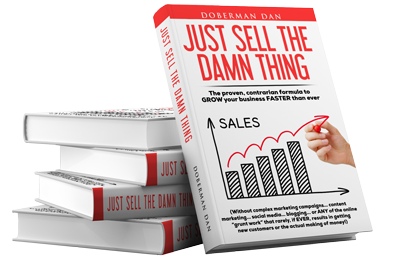 You’ll discover the tested and proven Doberman Dan system for coming up with the perfect big idea. Part of the system is very step-by-step, left brained stuff. The other part is pretty wild, right brained, tap into your dormant inner genius stuff. …and FEELING his or her own thoughts and emotions. Breakthrough stuff, I’m telling ya. In 20 years I’ve NEVER seen any other copywriter reveal it. Cuz most of ‘em don’t know it. And the ones who do, want nothing but to keep these secrets to themselves. The December issue of The Doberman Dan Letter will be mailed out to the knights in my Marketing Camelot any day now. Click here to claim your knighthood TODAY so you don’t miss out on this breakthrough never-before-revealed issue. … without the secrets I reveal in the December issue you’re gonna LOSE 1,000x’s… or possibly even a MILLION times more money over the next 12 months than what the investment is to become a knight in my Marketing Camelot. …the only logical decision is to click here. Previous post: Are YOU part of the “in” crowd?